This car would look awesome with the evo bumper. I'm also working on the badging, cluster, and sills. I just got done taking apart the trans today. Took my sweet time since it's kinda cold and drizzling. Figures a cold front would come in on the weekend. 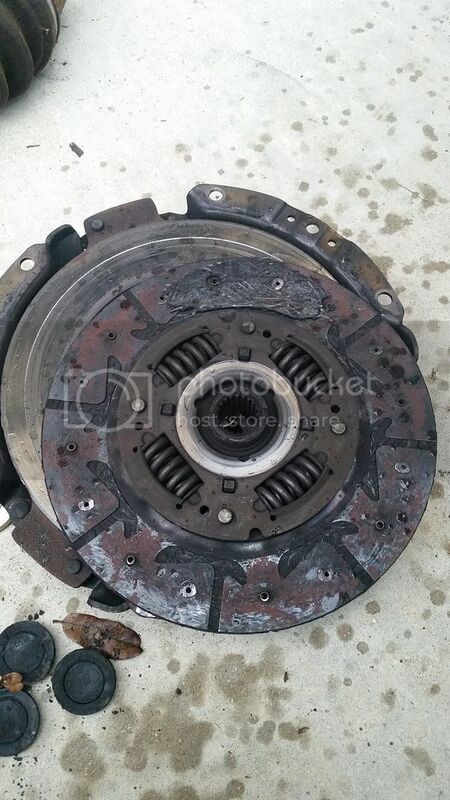 Factory clutch exploded. Only a small portion of pad left. Not liking the XTD stage 3 clutch. Although it would be great for FI, it's just too much chatter for my daily liking. It seems as though the fans kick on correctly, but it was low on fluid, and someone has gone through the thermostat and replaced the hoses with universal ones. I'm going to have to keep a close eye on it all. Luckily, I have a spare rad and maybe a hose from when I did the single core conversion on the race Tib. Anyone have the stock hoses available? One other thing I noticed was the cloth seats seem to sit higher than the leathers. Don't like them at all. I'll have to keep an eye out for replacements. Anyone have stock leather seats? Next up is the front brakes, an alignment, and respray the fender and maybe a couple other exterior parts if it comes out ok.
Got a question for you. The car came with what looks like a copied key. The trunk lock was busted out for some reason. Is there a way to replace the trunk lock to be keyed the same? Or, should I get a whole new lockset? You can get just the trunk lock, but it won't be keyed the same. A locksmith can re-key it if you want it to match. Nice find. ^^^Thanks. I'll look into getting a new one and re-keying it then. silicone hoses click me can't get any cheaper than that. Why are those $15 while they cost $70-80 everywhere else? Site glitch? probably liquidating stuff that doesn't sell. Not fond of the red, but yea $18.99 shipped can't be beat. Thanks again!